He cracked the door open, whispered into the dark, "Time to get up," and his silhouette disappeared from the vertical slice of light in the hallway. I scrambled from under the covers and slipped cool denim over my bed-warm thighs. Adding a shirt, my teeth began to chatter. 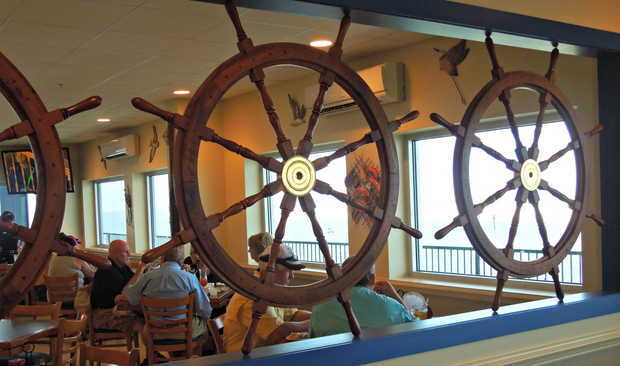 It was 4:30 a.m. and it was one of my favorite summer activities: going to open McElroy's Harbor House Seafood Restaurant with Uncle Mickey. I was nine. We drove across town on unpopulated roads, the only vehicle stopped at an empty intersection for a red light. We soon stood in the damp morning air at the door, the sound of the deadbolt releasing a new day. The seagulls were still tucked tightly into their nests. 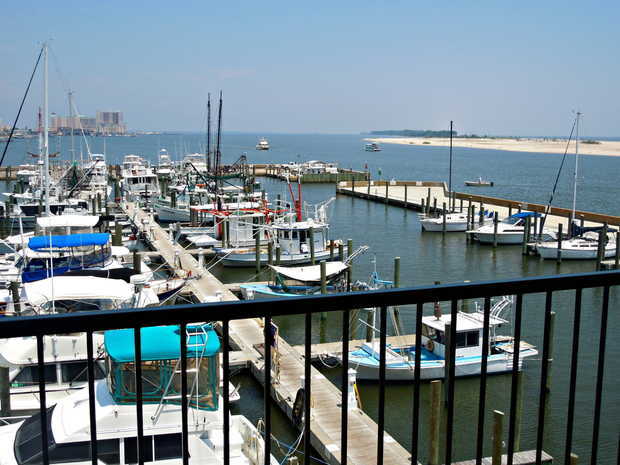 Even the water in the harbor slept from its constant licking at the shrimp boat hulls, sailboats, and mini-yachts tied neatly in each boat slip. Shrimp nets stood at attention, dry from yesterday's drags. What never slept were the fishy smell of Gulf waters and the breeze with her indiscriminate, humid hugs. Soon the cash register was spitting out yards of yesterday's sales reports, and coffee's aroma impregnated the dining room like a Folgers commercial. 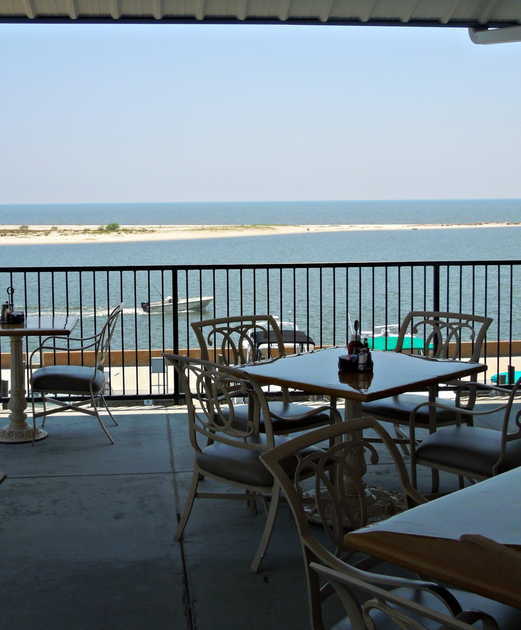 The good ole boys from Biloxi would trickle in for coffee and gossip like only a small town and a table at a locally owned restaurant can serve up. 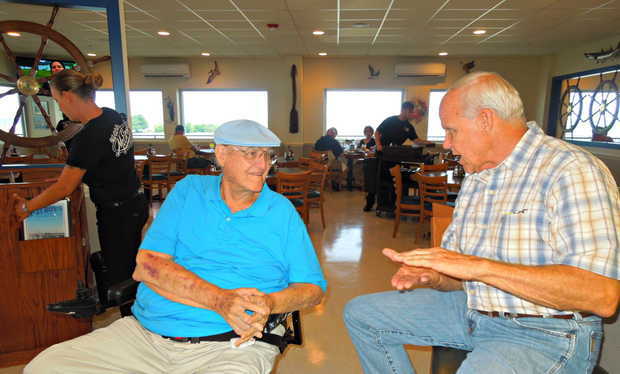 The police chief, shrimpers, business men all began their day with coffee served by Uncle Mickey himself, before the sign on the door read open or the wait staff arrived. Like a pinball machine, he would bounce from table to table, talking with old friends and acquaintances about the news of the day and yesterday's catch. I also remember going to the kitchen with Paw Paw, an old white house on Gill Avenue, masquerading as a commercial kitchen that boasted only rudimentary equipment. He had made a vat of his seafood gumbo that morning and let me ride over the Back Bay bridge in the bed of his pickup after school. He would turn off four box fans that had helped cool the cauldron. I helped him divvy gumbo into about 50 three gallon containers, label them, and line them like white pickets on shelves in the walk-in freezer. The hot plastic would burn my fingerprints after awhile, so I dragged them over the frost accumulating on the freezer shelves from leaving the door open too long. Paw Paw always let me lick the vats, and never made me do the dishes.I'd ride back across the bay, full and happy, smelling of crab meat and gumbo gravy that started as an auburn rue early that morning. Paw Paw was happy in a kitchen: his own, his restaurant's, his brother-in-law's--which one didn't matter. 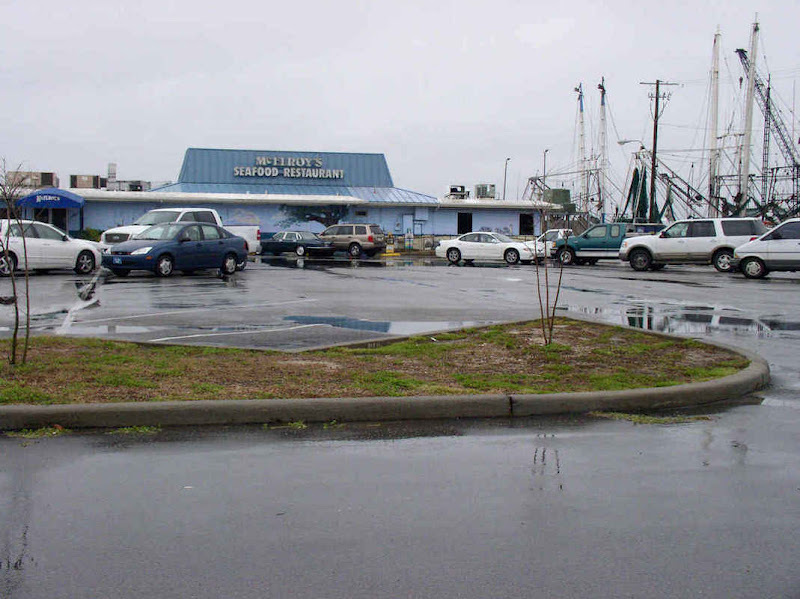 The gumbo and Paw Paw's homemade butter were classic Harbor House fare, and McElroy's became a Coast icon slowly over thirty years. Hurricane Katrina put an end to all that in the Biloxi Small Craft Harbor on August 29, 2005. Thirty foot storm surge has an uncanny ability to wash away a family business and a town's way of life. Memories may have been built to hurricane standards back in the 70s, but buildings bordered by land on only three sides weren't. 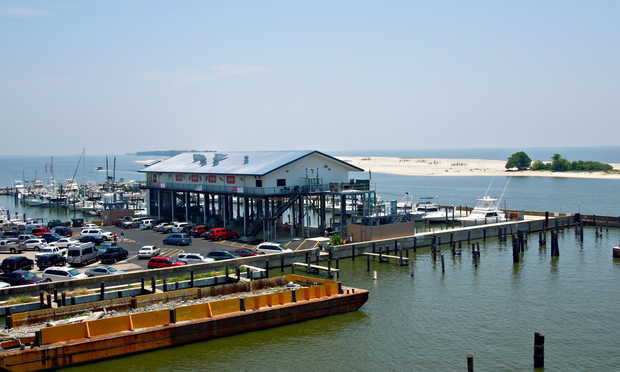 Not a single building in Biloxi stood on stilts until after Katrina. Even Camille didn't change that. The path was not clear sailing, but long and arduous, ebbing and flowing like the daily tides. Some days it seemed as close as the sand on Deer Island, just right there. In the end, a lease agreement survived the hurricane's wrath, too. 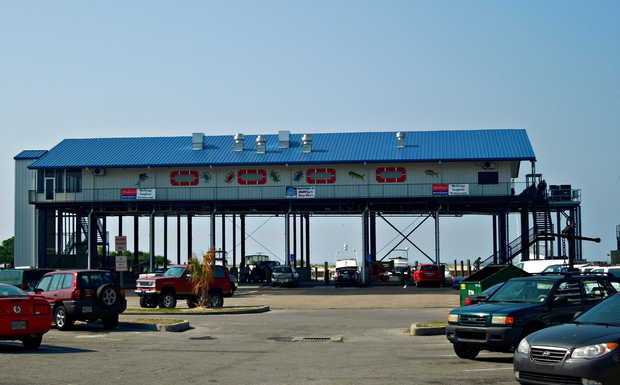 It's taken almost seven years, and McElroy's now stands atop spindly legs far above the new flood plane drawn by Katrina and the Corp. of Engineers. Funny how precariously top-heavy is better defense against future hurricane fury. The strategy is to rise above it, wisdom that was learned the hard way. It's a comeback story of all-American can do, served on a pedestal this time, instead of the old platter. It still goes great with the stuffed flounder. If you're ever in the neighborhood, stop in. I recommend the oyster po-boy. Congratulations, Uncle Mickey and Aunt Jane. Grandmommie and Paw Paw would be proud. To view a stunning before/after flash player version of Katrina damage to the restaurant, click here. All images of the new building came from the local newspaper's website/Facebook page. The article and photo gallery can be found here. What a great, life affirming post; congratulations to Uncle Mickey and Aunt Jane! Well done! What a happy memory and a wonderful history lesson. Thank you for sharing. What a journey. . .What a beautiful place! Congrats to Uncle Mickey and Aunt Jane!!! !